Blueberries are one of the highest antioxidant foods. The blueberry nutrition facts and its health benefits are considered below. Blueberries rank as having one of the highest antioxidant capacities among all fruits, vegetables and spices. They are rich in pro-anthocyanin natural pigment anti-oxidants which have been attributed to the longevity and wellness. The antioxidant rating ORAC value of 100 g fresh blueberry is 5562. Blueberries are phytonutrient superstars, containing significant amounts of antioxidant compounds - anthocyanadins, that give blue, purple and red colors to fruits and vegetables. In addition to their anthocyanins, blueberrries also contain hydroxycinnamic acids, hydroxybenzoic acids, flavonols and phenol-like antioxidants pterostilbene, resveratrol, carotene-ß, lutein and zea-xanthin. Blueberries are a very good source of vitamin C, vitamin K and manganese and a good source of fibre and copper. They contain a small amount of vitamin C, vitamin A and vitamin E.
Blueberries also contain a small amount of B-complex vitamins such as niacin, pyridoxine, folates and pantothenic acid, which help the body metabolize protein, carbohydrates and fats. It has been found that the nutritional antioxidant benefits of blueberries are more in organic blueberries. The organically grown blueberries have significantly higher total antioxidant capacity as well as considerably higher in total phenol antioxidants and total anthocyanin antioxidants than conventionally grown blueberries. Research has found that freezing blueberries does not reduce their nutritional benefits. So if you don't get fresh blueberries, you can eat frozen one. Blueberries are very low in calories. 100 g fresh blueberries provide only 57 calories. Furthermore, they contain a good amount of minerals like potassium, manganese, copper, iron and zinc. Manganese is used by the body as a co-factor for the antioxidant enzyme, superoxide dismutase. Copper is required for the production of red blood cells. Iron is required for red blood cell formation. The antioxidants in blueberry protect from harmful oxygen-derived free radicals in the body. These compounds protect us against cancers, ageing and degenerative diseases, and help lower blood sugar levels and control blood-glucose levels in type-II diabetes mellitus condition. Eating blueberries 1-2 cups per day for 1-3 months has been shown to reduce total cholesterol, raise HDL cholesterol and lower triglycerides. Blueberry can help protect the LDL cholesterol from oxygen damage, reducing the chances of clogging of the blood vessels. Blueberry can protect the cells lining the blood vessel walls. Potassium in blueberry can control heart rate and blood pressure. Eating blueberry can significantly reduce both systolic and diastolic blood pressures and help maintain these pressures. Eating blueberries may be beneficial not only for improvement of memory, but for slowing down the onset of other cognitive problems frequently associated with aging. Read more on best anti-aging foods. Blueberry with its low glycemic index and significant fibre content is helpful in blood sugar regulation in persons already diagnosed with blood sugar problems. The anthocyanins in blueberry protects the eye retina from oxygen damage and also damage from sunlight. Blueberries has been studied to lower risk of breast cancer, colon cancer, esophageal cancer (or oesophageal cancer) and cancers of the small intestine. 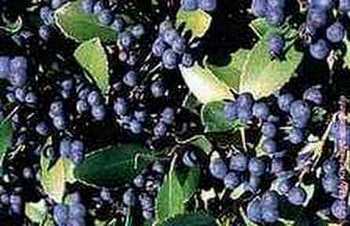 Grow Your Own Blueberries You can grow blueberries in pots at home and even learn how to propagate blueberry. Health benefits of fruits and vegetables. Wang SY, Chen CT, Sciarappa W et al. Fruit quality, antioxidant capacity, and flavonoid content of organically and conventionally grown blueberries, J Agric Food Chem. 2008 Jul 23, 56(14):5788-94. Epub 2008 Jul 1. 2008. Still AJ, Cash KC, Johnson WD et al. Bioactives in Blueberries Improve Insulin Sensitivity in Obese, Insulin-Resistant Men and Women, The Journal of Nutrition. Bethesda: Oct 2010. Vol. 140, Iss. 10; p. 1764-1768. 2010. Scibisz I and Mitek M. The changes of antioxidant properties in highbush blueberries (Vaccinium corymbosum L.) during freezing and long-term frozen storage, Acta Scientiarum Polonorum : Technologia Alimentaria Year: 2007 Vol: 6 Issue: 4 Pages/record No. : 75-81. 2007. Krikorian R, Shidler MD, Nash TA et al. Blueberry Supplementation Improves Memory in Older Adults, J Agric Food Chem. 2010 April 14; 58(7): 3996-4000. 2010. Basu A, Rhone M and Lyons TJ, Berries: emerging impact on cardiovascular health. Nutr Rev. 2010 Mar;68(3):168-77. Review. 2010.